For the chess player, see Peggy Wood (chess). Mary Margaret "Peggy" Wood (February 9, 1892 – March 18, 1978) was an American actress of stage, film, and television. She is best remembered for her performance as the title character in the CBS television series Mama (1949–1957), for which she was nominated for a Primetime Emmy Award for Outstanding Lead Actress in a Drama Series; her starring role as Naomi, Ruth's mother-in-law, in The Story of Ruth (1960); and her final screen appearance as Mother Abbess in The Sound of Music (1965), for which she was nominated for an Academy Award and a Golden Globe Award. Wood was born in Brooklyn, New York, the daughter of Eugene Wood, a journalist, and Mary Gardner, a telegraph operator. It has been erroneously claimed that she was a direct descendant of Daniel Boone, however she was actually descended from a different Boone immigrant ancestor. Wood was an early member of the Actors' Equity Association, spending nearly 50 years on the stage, beginning in the chorus and becoming known as a Broadway singer and star. She made her stage debut in 1910, as part of the chorus for Naughty Marietta. 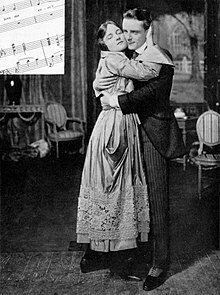 In 1917, she starred in Maytime, in which she introduced the song "Will You Remember". She starred in several other musicals before playing the role of Portia in a 1928 production of The Merchant of Venice. From the late 1920s until the late 1930s, Wood had lead roles in musicals staged in London and New York. She was a member of the Algonquin Round Table. In 1941, she starred in the New York premiere of Blithe Spirit as Ruth Condomine, whose husband is tormented by the ghost of his deceased first wife. Wood did not star in many films. Her few film appearances include roles in Jalna, A Star is Born, Call It a Day, The Housekeeper's Daughter, The Bride Wore Boots, Magnificent Doll, and Dream Girl. From 1949 to 1957, she played matriarch Marta Hansen in the popular CBS-TV series Mama, based on the 1943 Broadway play and 1948 film I Remember Mama. When General Foods cancelled the program, there was so much protest that CBS brought it back on Sunday afternoon, this time as a filmed series. As the network did not have all the affiliate station clearances that were needed, the show was put into syndication, where it was a huge success. 26 episodes were filmed. Following "Mama", Wood was also seen in episodes of Zane Grey Theatre and The Nurses. She co-starred with comedian Imogene Coca on Broadway in The Girls in 509. In October 1963, she and Ruth Gates appeared in a one-act play, Opening Night, which played in off-Broadway. Wood portrayed Fanny Ellis, a once famous star who prepares for a performance; the play lasted 47 performances. Ruth Gates was Aunt Jenny on the "Mama" series with Wood. She returned to movies in the 1960 CinemaScope production The Story of Ruth in a co-starring role, as what she referred to in her own book as a "blonde, blue-eyed Jewess". Her final screen appearance was as the gentle, wise Mother Abbess in The Sound of Music (1965), for which she was nominated for the Academy Award for Best Supporting Actress and the Golden Globe Award for Best Supporting Actress - Motion Picture. She was thrilled to be in the movie although she knew that she could no longer sing "Climb Ev'ry Mountain". She was dubbed (for singing) by Margery McKay. In her autobiography, Marni Nixon, who appeared in the film as Sister Sophia, said Peggy especially liked McKay's singing voice because she sounded as Peggy did in her younger days. In 1969, Wood joined the cast of the ABC-TV soap, One Life to Live as Dr. Kate Nolan and had a recurring role until the end of the year. Her first autobiography, How Young You Look, was published by Farrar and Rinehart in 1941. An update, Arts and Flowers, appeared in 1963. She also wrote a biography of actor John Drew, Jr., as well as a novel called The Star Wagon and was a co-author of a play called Miss Quis. Wood received numerous awards for her theatrical work and for a while was president of the American National Theater and Academy (ANTA). Wood was married and widowed twice. Her first husband (poet/writer John V.A. Weaver) died at the age of 44. She gave birth to their son (David Weaver) in 1927 at the age of 32. Her second husband (in 1946 William H. Walling) was an executive in the printing business who died in 1973. They were married for 27 years. She was a devout Episcopalian and a member of the Episcopal Actors Guild. Wood died on March 18, 1978, in Stamford, Connecticut, following a stroke. She was 86 years old. ^ Wikitree Family View for Mary Margaret Wood. ^ "Members of the Algonquin Round Table". Archived from the original on September 29, 2011. Retrieved February 14, 2010. Wikimedia Commons has media related to Peggy Wood.